Designing the bridge of a yacht has always fascinated me because I like sailing and it's the place where I spend most of my time while under way. So I've always approached this task with enthusiasm. The bridge is the meeting point between the necessities of a ship and those of a yacht. 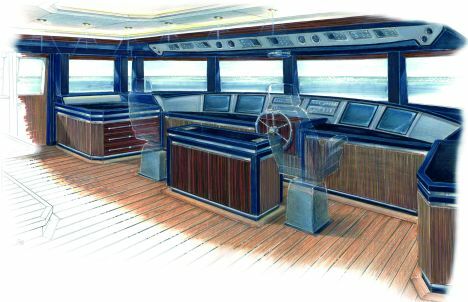 In this space the expectations of very different figures are interwoven: owners love to spend time there in order to "feel the pulse" of the situation on board and also to delight themselves with, and have their friends admire, all the latest electronic novelties they've chosen for their boat. Captains, especially on larger vessels, have such and so many responsibilities that it is one of their rights to consider the bridge their own kingdom. In fact it happens that in designing this element for a superyacht our interlocutors are chiefly captains rather than shipyard personnel or owners. Smaller vessels, i.e. 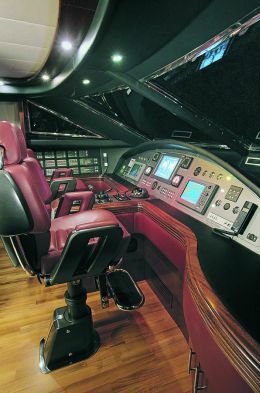 yachts under 60- 70', have bridge instruments and design which are inspired by the aeronautic field and in which the steering position is a single one, that is to say seated. A row of anatomically designed seats resolves this problem and helmsman and co-helmsman, seated in the centre, both have access to the main controls - engine levers, radio, autopilot - while the multifunction displays in front of them permit both to see radar, chart and bathymetric information. This ideal situation may also be shared by guests, seated at the sides on the auxiliary chairs. On smaller vessels whose electrical switchboard is controlled directly from the seat on the bridge and not from the engine room, the switchboard must be directly accessible to the helmsman, who is sometimes the owner and is often the only one on board with knowledge of these systems, but it must not be in front because there would be a risk of dazzling the helmsman. A good position is at the side or behind, if there's a bulkhead available, so you need only swivel the chair, without standing up. It might seem superfluous to sit on seats worthy of a racing car, but if we think of the stresses and jolts undergone in a heavy sea on a yacht doing 25-30 knots, a good, enveloping seat gives us a sense of security, a stable support for the body and the possibility of always having a hand free for the instruments. On bridges of this kind it touches me to see a wheel right in front of the helmsman's seat, maybe in teak with spokes. Are we really going to renounce the ease of handling power-assisted rudders by means of a tiller? The wheel is a romantic memory of the bridges of long ago and it would be wiser to keep one for installation in emergency, for steering by hand in the case of electrical breakdown, rather than having it constantly in the way. From 90 footers upwards the bridge starts to be more nautical, because the crew's stay aboard these vessels is far longer. Long voyages can be made under all weather conditions and also at night, so there is the need to remain seated but also to move around, to check the sides of the yacht or simply to stretch your legs. 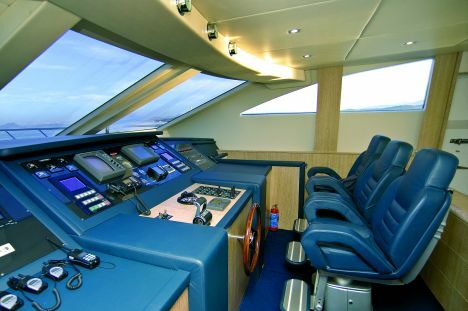 The bridge on a large yacht is organised in three main zones: sailing, chart area and communications. The communications zone is sometimes completely separate, a radio room with the main radio apparatus, printer and on-board computer, substantially a back office where the lights can be kept on at night without disturbing the helmsman. The chart area still includes the big traditional table with chart drawers and nightlight, plus the GPS repeater or an auxiliary screen of the cartographic computer. For reasons of space the chart table is often placed next to the command station but it would be better to set it against the aft bulkhead to avoid producing annoying reflections on the windshield. 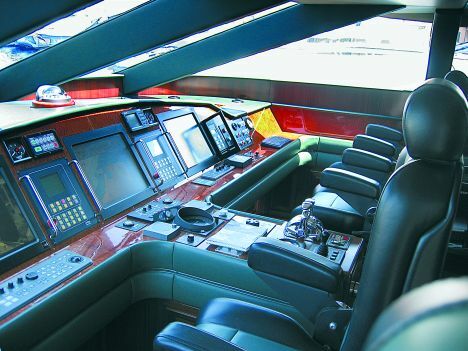 The actual command station of a large yacht is of clearly nautical derivation. On the bridge there will almost always be two people on watch. The captain sits in the command chair, set at a certain distance from the instrument panel, from which practically nothing can be done except check, precisely, that all is going well. It is best if the helmsman steers standing up, or at the most leaning against a backrest bar, in order to avoid the risk of falling asleep after two or three hours under way at night. Instruments are checked on foot, and in difficult or dangerous situations such as bad weather in restricted waters you stand close to the instruments both to have rapid access to them and to keep as close as possible to the windshield. The tendency to move closer to the windows in conditions of poor visibility comes natural to everyone, even while driving a car. It's an unconscious attempt to see better through a dirty or wave and rain-drenched windshield. This is why on a superyacht it is best to use vertical windows which are very easy to keep clean. They can be protected from the sun and produce less annoying reflections of the instruments below. This is not always possible because sometimes this type of choice clashes with the yacht's general external style and you are obliged to install powerful washing systems and dimmers or switches on all, absolutely all sources of light and screens on the bridge. The design of the windows and superstructures must guarantee good all-round visibility and easy access to the side for looking astern. This is why the layout of doors leading outside and doors on the bridge in general, in relation to the yacht's bow, must be carefully evaluated. Moreover the décor should envisage dark colours that do not cause reflections and disturb the helmsman, at least in the forward zone. This often conflicts with the stylistic expectations of owners who want to see a welcoming bridge where they can invite their guests and not the command station of a battleship, which is generally what captains ask us for.